First and foremost, Paper Wars is a wargame review magazine. Each issue includes approximately 6 or more detailed game reviews on both new and old wargames. They don't discriminate against the older games here... In addition, each issue includes a full wargame produced in color, incorporating the same high production qualities you've come to expect from Compass. 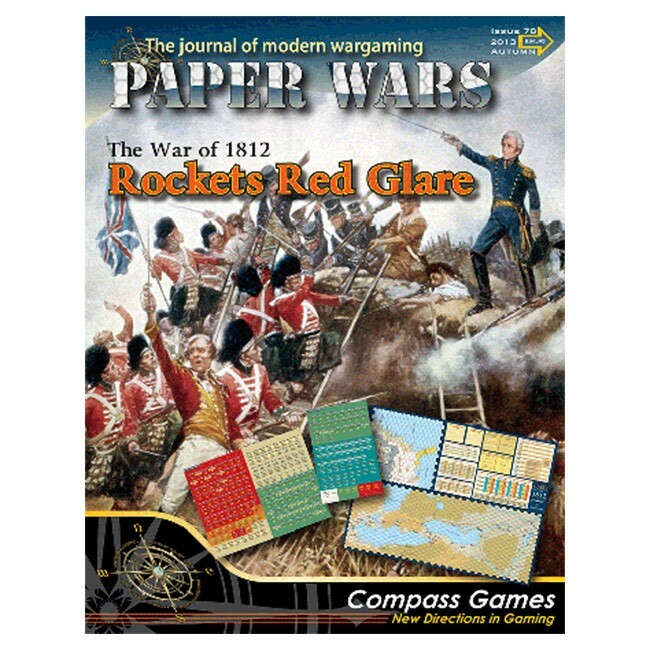 ROCKETS RED GLARE is a two player game type simulation of the War of 1812 in North America on the strategic and operational levels. The entire war is covered in quarterly turns corresponding to seasons, with strategic level play occurring on a map of the United States East & Gulf coasts, as well as some interior areas and the associated coastal seas. Operational level play is also in quarterly turns and takes place on a map of the Great Lakes border area between the United States and Canada. One player controls the forces of the United States and a second player controls the forces of England and Canada. Each game turn is composed of both a strategic turn, played on the strategic U.S. map, followed by an operational turn, played on the operational Great Lakes map. Every Fall game turn a special inter-turn phase is played after the conclusion of the operational turn to set up events for the upcoming year. ROCKETS RED GLARE is both a naval and a land combat game. The war itself was one of those strange affairs that started due to poor political decisions and ended due to lack of militarily significant results and the slow realization that it had all been a mistake anyway. The long term results, however, were important. The Unitied States ceased to be a breakaway English colony in the eyes of the world, and most particularly England. And Canada was turned permanently away from the path of the American republic, to move slowly down its own course to independence. ROCKETS RED GLARE depicts the military aspects of this key turning point in the history of North America. The game has 255 counter, a 22"x28" map sheet of the combat areas including charts and tables, and a set of rules to play the game. Game design by Stephen Newberg.